September 1, 2015 – Toronto, Ontario – Corsa Coal Corp. (TSXV: CSO) (“Corsa”), a premium quality metallurgical and thermal coal producer, yesterday reported financial results for the three and six months ended June 30, 2015. Corsa has filed its unaudited Condensed Interim Financial Statements for the three and six months ended June 30, 2015 and 2014 and related Management’s Discussion and Analysis on www.sedar.com under Corsa’s profile and has posted these documents to its website www.corsacoal.com. Despite a very challenging coal pricing environment, Corsa achieved positive adjusted EBITDA(1) at its Northern Appalachia (“NAPP”) and Central Appalachia (“CAPP”) Divisions, as well as on a consolidated basis. NAPP productivity improvement initiatives and cost containment efforts have been successful with the cash production cost per ton sold(1) for metallurgical coal decreasing 16.5% from the three months ended June 30, 2014. The Casselman Mine successfully completed a challenging geologic transition under the Casselman River. Corsa’s operations continue to achieve industry leading safety performance, with violation per inspection day (VPID) rates that are 50% lower than the national average. The Quecreek mine was restarted in May 2015 as a result of securing a long-term thermal coal sales contract that allowed Corsa to economically mine the metallurgical and thermal coal reserve base. NAPP continues to aggressively manage its cost structure. The mines idled during the first quarter 2015, as well as other inactive deep mining operations, were sealed in an effort to significantly reduce idle mine costs. NAPP incurred idle mine costs of $2.7 million during the six months ended June 30, 2015, which is expected to dramatically decline over the balance of the year as a result of these mines being sealed. Additionally, Corsa successfully consolidated its coal processing plants in the second quarter 2015, resulting in significant operating cost savings. Efforts are being undertaken to reduce general and administrative expenses and water treatment expenses at NAPP, and to manage reclamation efforts more efficiently. 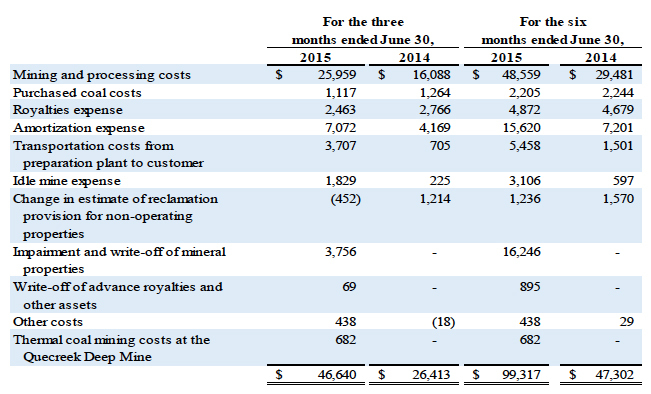 CAPP improved upon its first quarter 2015 performance by generating adjusted EBITDA(1) of approximately $948,000 during the three months ended June 30, 2015, driven by excellent cost performance. CAPP also has substantially completed the face up for the Cooper Ridge Deep Mine. In February 2015, Corsa restructured its senior management team by appointing Peter Merritts to the role of President – NAPP and in June 2015, Kevin Harrigan was appointed to the role of Chief Financial Officer and Corporate Secretary. NAPP metallurgical coal sales of 265,000 tons. NAPP realized price per ton sold(1) for metallurgical coal of $78.07. NAPP cash production cost per ton sold(1) for metallurgical coal of $66.66. CAPP thermal coal sales of 190,000 tons. CAPP realized price per ton sold(1) for thermal coal of $66.27. 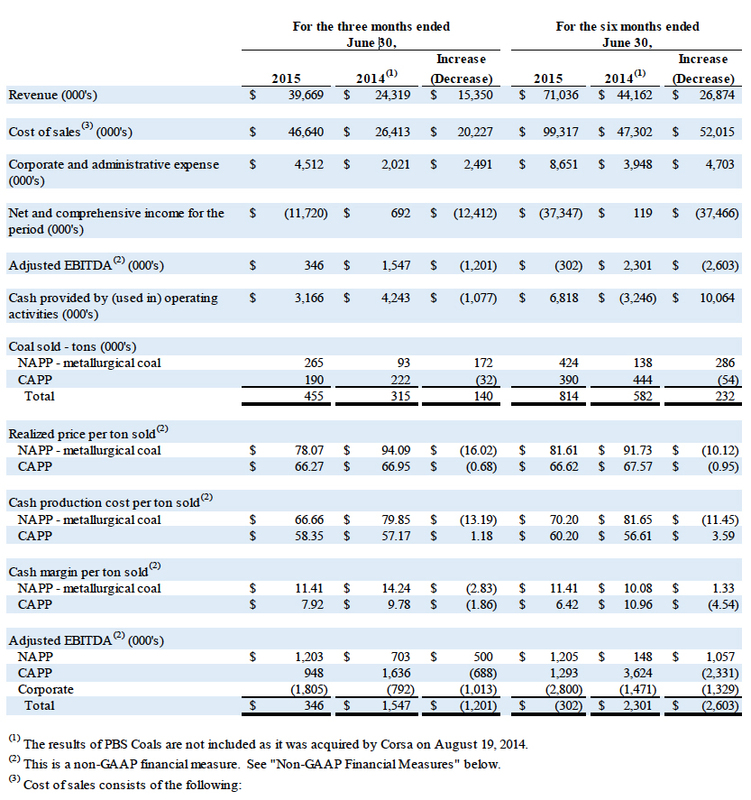 CAPP cash production cost per ton sold(1) for thermal coal of $58.35. George Dethlefsen, Chief Executive Officer, commented, “Corsa continued its focus on cost reductions and asset optimization in the second quarter, while at the same time as positioning the company for the future. At the NAPP Division, we successfully completed the three-month crossing of the Casselman River at our Casselman Mine in July. This initiative grants us access to the main body of the coal reserve at the mine and positions us well for the remainder of the year and beyond. We were pleased to restart the Quecreek Mine after securing local thermal coal contracts. Our efforts in the thermal coal space diversify our revenue sources and protect against a further weak metallurgical coal price environment. The CAPP Division showed outstanding cost performance across all operations, and also substantially completed the face up for the new Cooper Ridge deep mine. The mine represents the future of the division and will strategically reposition the division over time into the premium-priced specialty and industrial coal markets. Current metallurgical coal prices remain at depressed levels where a substantial amount of global production is uneconomic. This situation arose as a result of global producers committing to multi-billion dollar projects in a significantly higher price environment. Large scale mines often take three or more years from final investment decision to first production. New supply came online over 2013 and 2014, a period where demand growth softened. This supply growth is expected to mitigate in 2015 as the pipeline of growth projects is exhausted and prices are insufficient to incentivize new production. Corsa expects that over time, the fundamentals of the metallurgical coal market will rebalance as supply growth ends and production cutbacks are implemented. Weak Chinese demand for imported metallurgical coal, in combination with a strong U.S. dollar and low dry bulk freight rates, have continued to put downward pressure on seaborne metallurgical coal pricing. The third quarter 2015 coking coal benchmark pricing decreased to $93.00 per metric ton, representing a decrease of approximately 15% from the second quarter of calendar 2015 and a year-over-year decrease of approximately 23%. The third quarter price is the first time the benchmark settlement was below $100 per metric ton since 2007, on a nominal basis, and represents a point on the cost curve where analysts estimate half of the global seaborne production is unprofitable. As metallurgical coal production is rationalized in places like China, Western Canada, Australia and the United States, Corsa expects the seaborne metallurgical coal fundamentals to normalize. Domestically, severe financial distress has caused high profile bankruptcies in 2015 and will likely lead to additional supply cuts in the near future. This situation has also created an environment where producers are deferring capital expenditures, not reinvesting in reserves or permitting efforts, and are highly vulnerable to supply disruptions. For these reasons, Corsa believes that the domestic market is poised to rebound faster than the international seaborne market. Corsa’s geographic proximity to over 50% of domestic coke production capacity and short rail distance and multiple options to access the Baltimore export terminals solidify Corsa’s ability to take advantage of any recoveries in coal pricing. Metallurgical coal sales in 2015 are expected to be in the range of 725,000 to 775,000 tons. As of the date of this press release, approximately 90% of these sales are committed at the midpoint of the range. Actual sales will depend on customer demand and market conditions. Vessel nominations for export sales are determined by customers and concluded on a month-by-month basis. The CAPP coal sales for 2015 are expected to be in the range of 775,000 to 825,000 tons. As of the date of this press release, approximately 96% of these sales are committed at the midpoint of the range. Actual sales will depend on customer demand and market conditions. CAPP also has sales contracts in place for 500,000 tons in 2016. Management uses realized price per ton sold, cash production cost per ton sold and adjusted EBITDA as internal measurements of operating performance for Corsa’s mining and processing operations. Management believes these non-GAAP measures provide useful information for investors as they provide information in addition to the GAAP measures to assist in their evaluation of the operating performance of Corsa. Reference is made to the Management’s Discussion and Analysis for the three and six months ended June 30, 2015 for a reconciliation of non-GAAP measures to GAAP measures. Refer to Corsa’s unaudited Condensed Interim Consolidated Financial Statements for the three and six months ended June 30, 2015 and 2014 and related Management’s Discussion and Analysis, filed on www.sedar.com under Corsa’s profile and posted to Corsa’s website www.corsacoal.com, for details of the financial performance of Corsa and the matters referred to in this news release. Certain information set forth in this press release contains “forward-looking statements” and “forward-looking information” under applicable securities laws. Except for statements of historical fact, certain information contained herein relating to projected sales, coal prices, coal production, mine development, expected cash production costs, geological conditions, future capital expenditures, reduction in operating costs and expectations of market demand for coal, constitutes forward-looking statements which include management’s assessment of future plans and operations and are based on current internal expectations, estimates, projections, assumptions and beliefs, which may prove to be incorrect. Some of the forward-looking statements may be identified by words such as “estimates”, “expects”, “anticipates”, “believes”, “projects”, “plans”, “capacity”, “hope”, “forecast”, “anticipate”, “could” and similar expressions. These statements are not guarantees of future performance and undue reliance should not be placed on them. Such forward-looking statements necessarily involve known and unknown risks and uncertainties, which may cause Corsa’s actual performance and financial results in future periods to differ materially from any projections of future performance or results expressed or implied by such forward-looking statements. These risks and uncertainties include, but are not limited to: risks that the actual production or sales for the 2015 fiscal year will be less than projected production or sales for this period; risks that the prices for coal sales will be less than projected; liabilities inherent in coal mine development and production; geological, mining and processing technical problems; inability to obtain required mine licenses, mine permits and regulatory approvals or renewals required in connection with the mining and processing of coal; risks that Corsa’s preparation plants will not operate at production capacity during the relevant period, unexpected changes in coal quality and specification; variations in the coal mine or preparation plant recovery rates; dependence on third party coal transportation systems; competition for, among other things, capital, acquisitions of reserves, undeveloped lands and skilled personnel; incorrect assessments of the value of acquisitions; changes in commodity prices and exchange rates; changes in the regulations in respect to the use, mining and processing of coal; changes in regulations on refuse disposal; the effects of competition and pricing pressures in the coal market; the oversupply of, or lack of demand for, coal; inability of management to secure coal sales or third party purchase contracts; currency and interest rate fluctuations; various events which could disrupt operations and/or the transportation of coal products, including labour stoppages and severe weather conditions; the demand for and availability of rail, port and other transportation services; the ability to purchase third party coal for processing and delivery under purchase agreements; and management’s ability to anticipate and manage the foregoing factors and risks. The forward-looking statements and information contained in this press release are based on certain assumptions regarding, among other things, coal sales being consistent with expectations; future prices for coal; future currency and exchange rates; Corsa’s ability to generate sufficient cash flow from operations and access capital markets to meet its future obligations; the regulatory framework representing royalties, taxes and environmental matters in the countries in which Corsa conducts business; coal production levels; Corsa’s ability to retain qualified staff and equipment in a cost-efficient manner to meet its demand; and Corsa being able to execute its program of operational improvement and initiatives to realize cost synergies following the PBS Transaction. There can be no assurance that forward-looking statements will prove to be accurate, as actual results and future events could differ materially from those anticipated in such statements. The reader is cautioned not to place undue reliance on forward-looking statements. Corsa does not undertake to update any of the forward-looking statements contained in this press release unless required by law. The statements as to Corsa’s capacity to produce coal are no assurance that it will achieve these levels of production or that it will be able to achieve these sales levels.